Our Popular class Cooking with Convection and Steam – Life Made Easier with Wolf’s Convection Steam Oven, offered frequently at Riggs Distributing, features a complete exploration of the features and benefits of this valuable kitchen appliance as well as delicious seasonal recipes. The Asparagus and Corn Quiche, developed by our Riggs’ chefs, can be assembled quickly and yet achieves a deliciously light flavor thanks to a flaky puff pasty crust and sweet, fresh vegetables. 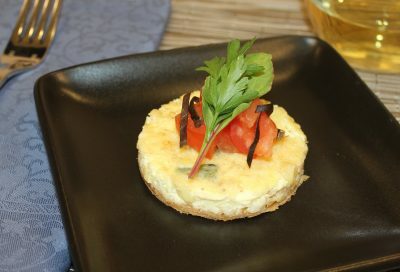 The components of this quiche are cooked in the Wolf CSO: convection mode for the crust and final baking, and steam mode for the vegetables. The convection mode achieves a golden flaky crust while the steam mode makes the vegetables crisp-tender and without losing most of their valuable nutrients. Combine that with a light tasting custard base and your guests will be craving for more. Add a salad to make the dish into a light lunch or dinner, or experiment with other ingredients for a different flavor profile. Finely diced ham, chopped mushrooms, or red bell peppers would make great additions or substitutes! To register for our next Wolf CSO class click here. Make an appointment to see the CSO and look at the Bay Area’s largest selection of Sub-Zero, Wolf and ASKO appliances or visit us on most Saturdays which are open to the public. Do you have a favorite combination of ingredients to use in your quiche recipe? Share them in the comments.